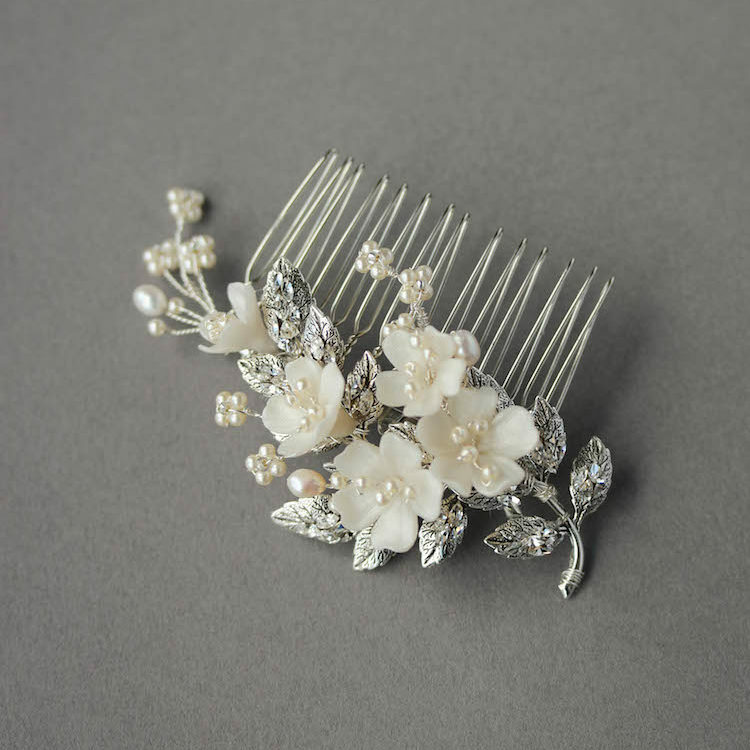 Gorgeous Anna first contacted us about ordering a wedding comb for her upcoming nuptials. But the poor darling was super busy finishing her PhD (as you do when you’re organising a wedding!) and living in rural Australia, that it all got a bit much. Enter Ashley – her bestie. Ashley took over the organisation and design. Knowing Anna’s style, she decided to create her dream wedding comb and order it as a wedding gift. Isn’t that just the sweetest?! Anna was completely on-board. She didn’t want to see any pictures, wanting the gift to be a complete surprise. Oh to be a fly on the wall when she viewed it for the first time! And pass the tissues! Initially inspired by ALESSIA for its silver colour palette and BLUSHING for its shape and size, we couldn’t help but reveal a sneak preview of our latest antique silver comb MARQUISE, before it was released. And she loved it! We couldn’t love this slightly larger and fuller version of MARQUISE. The antique silver details evoke a sense of sophisticated old world charm. While the addition of flowers and delicate pearl sprigs add a modern and fresh element. The comb is versatile enough to be worn to the side of an updo or Hollywood waves, or in the top of bun or chignon. If, like Ashley, you want to help your close friend or relative create the wedding accessory of their dreams – why not consider one of our bridal gift cards? We’d love to hear from you!